I have been reading some blogs this week about Mother's day. 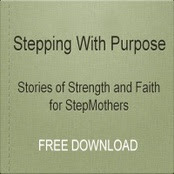 As I was reading,I started thinking about being a "mom" and being a "stepmom". I am a biological mom to two great adult "kids" and a stepmom to a great teenage daughter.As I look back and think about the last 4 years of being a step parent I have learned a few things I would like to share this Mother's Day. Blending a family does take time and there will be "bumps" along the way. I always strive to show a positive attitude as a mom/stepmom.This is something I learned from my mom and I want to pass that along to my children.Try to find the good in all situations. There may be times that you think there is nothing "good",but strive to see even a "tiny"bit of good.This can be difficult at times in step parenting.There is no greater job and no greater reward of being a mom/stepmom.I pray that you are blessed on this Mother's Day!